The brown skua (Catharacta antarctica) belongs to the family of skuas and jaegers, Stercorariidae. These skua species are distributed in Antarctic Peninsula, subantarctic regions of the Atlantic, Indian and Pacific Oceans. Vagrant brown skua populations have been observed in the coasts of India, Oman and Iran. There are three recognized subspecies of brown skua. The brown skua (Catharacta antarctica) is closely related to great skua (Catharacta skua), Chilean skua (Catharacta chilensis) and south polar skua (Stercorarius maccormicki). 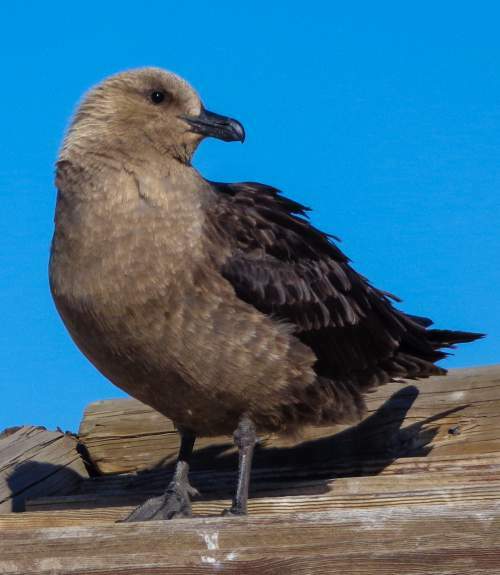 The three recognized subspecies of brown skua are: Catharacta antarctica antarctica (Lesson, 1831), Catharacta antarctica hamiltoni Hagen, 1952 and Catharacta antarctica lonnbergi Mathews, 1912. The brown skua (Catharacta antarctica) is a large seabird, measuring about 65 cm in length and weighing 1500 to 2200 grams. The wingspan is 125 to 160 cms. The overall plumage of these species is brownish shades with pale flecking. Both the sexes look alike, but the female is larger. The wings are long, broad and pointed. The wings have distinctive white outer wing flashes. The bill of the skua is black and hooked. The legs are dark gray with webbed feet and sharp claws. The irises are black. Their call is a repetitive “couk...couk...couk" sound. 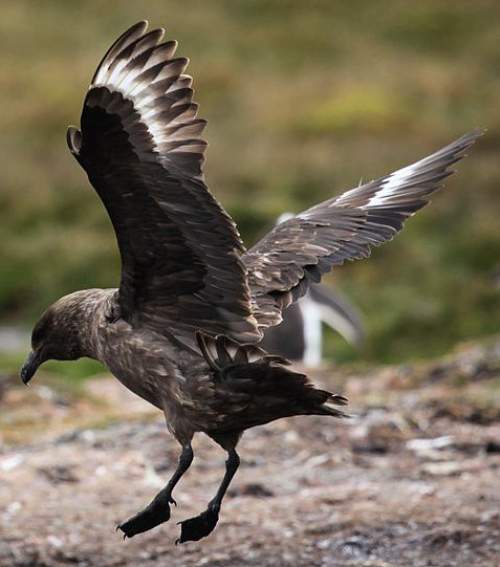 The brown skua species are distributed in the coasts of Antarctica, Australia, Heard Island and McDonald Islands, French Southern Territories, New Zealand, Norfolk Island, St Helena, Uruguay, Falkland Islands, Argentina, South Africa, Sri Lanka, Maldives and Seychelles. The subspecies C. a. antarctica is distributed Falkland Islands and South Argentina and winters in South America. The subspecies C. a. hamiltoni is distributed Tristan da Cunha and Gough Islands and is sedentary. The subspecies C. a. lonnbergi is distributed Antarctic Peninsula and subantarctic regions of Atlantic, Indian and Pacific Oceans. Vagrant brown skua populations have been observed in the coasts of India, Oman and Iran. The brown skua species do not normally occur in forests. These species occur in altitudes from 0 to 100 meters. They inhabit subantarctic grasslands and various marine ecosystems. 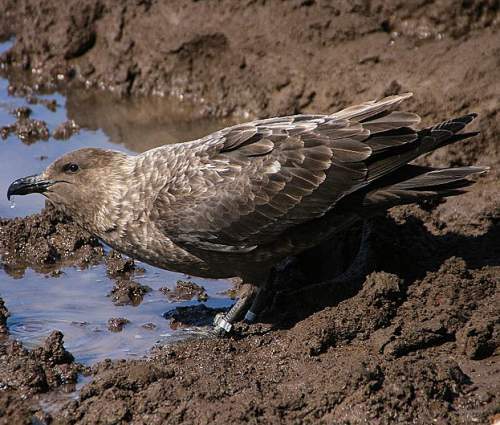 The brown skuas inhabit marine ecosystems like, rocky offshore islands, intertidal rocky shoreline, intertidal beaches, intertidal pools, shallow seas with macroalgal growth (kelp and seagrass), marine pelagic zones and oceanic zones. The diet of these brown skua species is mostly fish and birds. Fish, birds, small mammals and carrion are the primary food. They feed opportunistically on prey. They are found to scavenge around fishing boats and ships. They prey upon eggs and chicks of penguins, adults and fledgling petrels, burrow-nesting prions, gadfly petrels, storm-petrels and shearwaters. They are also kleptoparasites, robbing the seabirds of their catch by high speed pursuit and strikes from above. The breeding season of these brown skua species is from September to December. Loose breeding colonies are formed. 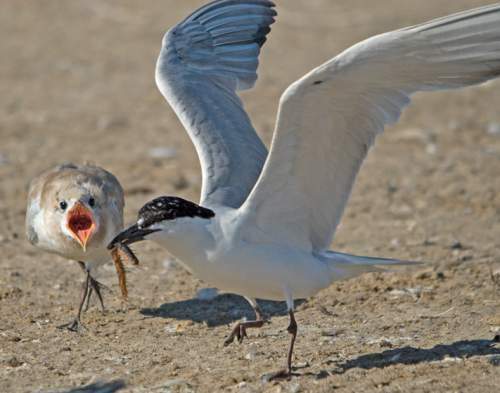 These birds are monogamous and highly territorial and attack intruders. Quite often breeding territories are occupied by trios, comprising one female and two males. These skua species nest on grass, gravel or bare rock. Sometimes the scrape nest may be lined with grass or moss. The typical clutch contains two large pale brown mottled eggs. Both the parents take part in incubation and in feeding chicks. The chicks hatch out in 29 to 33 days and fledge at 58 to 63 days. The brown skua is a partially migratory bird. Breeding populations of brown skua occur in Antarctic Peninsula and subantarctic regions of the Atlantic, Indian and Pacific Oceans. They disperse slightly northwards from the breeding grounds for wintering. Post breeding, the brown skua juveniles may disperse and establish in new locations within the range. They may make local movements for feeding and breeding within their range. The global population size of the brown skua (Catharacta antarctica) is estimated to be around 39,000 to 42,000 individual birds. The overall population trend of these species is considered to be stable. Throughout its range it is reported to be rare to common. The generation length is 17.1 years. Their distribution size is about 135,000,000 sq.km. The brown skua (Catharacta antarctica) does not approach the thresholds for being Vulnerable either under the range size criterion, or the population trend criterion or under the population size criterion. Loss of habitat due to global warming is the main threat that may endanger the survival of these species. The IUCN (International Union for Conservation of Nature) has categorized and evaluated the skua species and has listed it as of "Least Concern". CITES (the Convention on International Trade in Endangered Species of Wild Fauna and Flora) status is ‘Not Evaluated’ for the brown skua (Catharacta antarctica). Current topic in Birds of India: Brown skua - Catharacta antarctica. The Malabar pied hornbill (Anthracoceros coronatus) is a medium-sized, pied hornbill belonging to the family Bucerotidae. These hornbill species are distributed in India and Sri Lanka. These Malabar pied hornbill species are monogamous breeders nesting in natural cavities in trees. These hornbills are monotypic species. The Malabar pied hornbill (Anthracoceros coronatus) is closely related to oriental pied hornbill (Anthracoceros albirostris) and Palawan hornbill (Anthracoceros marchei). The Malabar pied hornbill (Anthracoceros coronatus) is a large hornbill, measuring about 65 cm in length. The overall plumage of these Malabar pied hornbill species is black. The belly region and the undertail are whitish. The outer feathers of the tail are also whitish. There is a white patch on the throat. The trailing edge of the wings is white. The bill is large, curved, creamy yellow, with a large black and creamy white casque. The irises are black and the female has white orbital skin. The legs are covered with white feathers and the feet are bare and gray. Their call is a screaming “rrraah..rrraah" sound. 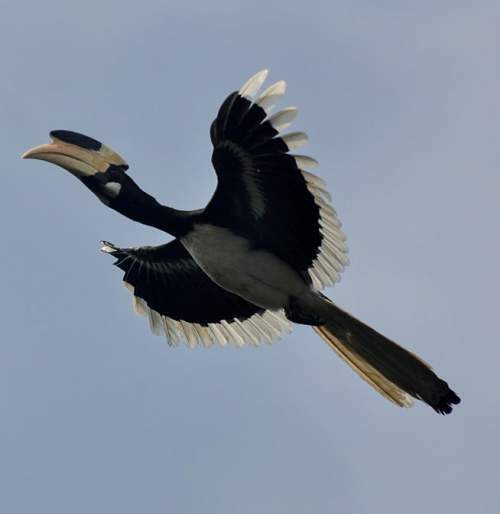 The Malabar pied hornbill species are distributed in India and Sri Lanka. 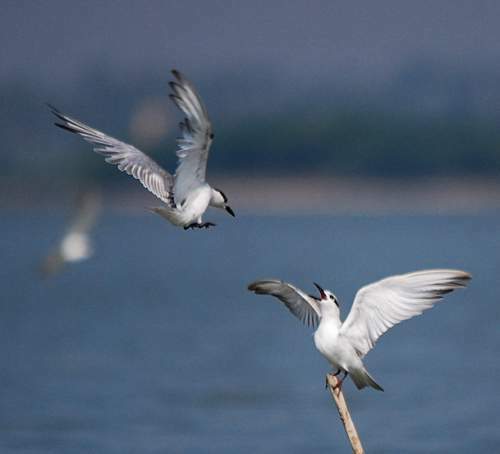 In India, these species are distributed in the states of Maharashtra, Goa, Karnataka, Tamil Nadu, Kerala (Malabar region), Madhya Pradesh, Telangana, Andhra Pradesh, Chhattisgarh, Odisha and Jharkhand. The Malabar pied hornbill species have high forest dependency. These species occur in altitudes from 0 to 100 meters. They inhabit various natural forest and lowland ecosystems. They also inhabit artificial terrestrial ecosystems. The artificial ecosystems include plantations, orchards and rural gardens. The natural ecosystems of Malabar hornbill include subtropical and tropical dry forests and subtropical and tropical moist lowlands. The diet of these Malabar pied hornbill species is mostly fruits. Berries, figs, wild fruits, orchard fruits, small mammals, small birds, small reptiles and insects are the primary food. They collect the food with the tip of the bill and toss it back to the throat. The breeding season of these Malabar pied hornbill species is from March to September in India. These birds are monogamous in nature, usually pairing for life. They nest in tree cavities near the canopy. 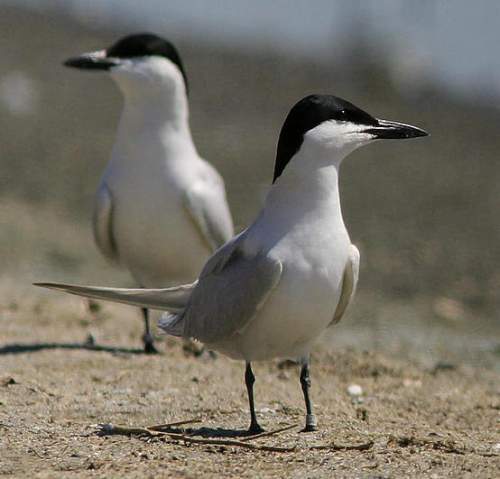 The same nesting site may be used in consecutive breeding seasons by the same pair. The entrance to the hole is sealed off by the female hornbill with a wall made of mud, droppings and fruit pulp, leaving a small opening for it to squeeze into the cavity. After entering the cavity, the female seals the opening leaving a small slit for transferring food by the male. The typical Malabar hornbill clutch contains two to three eggs. The male feeds the female and the chicks. When the nestlings grow large, the female comes out by breaking the wall and rebuilds the wall. Now both the parents collect food and feed the chicks. The Malabar pied hornbill is a non-migrant sedentary bird. Post breeding, the hornbill juveniles may disperse and establish in new locations within the range. They may make local movements for feeding and breeding within their range. They may resort to nomadic life when there is dearth of food. The global population size of the Malabar pied hornbill (Anthracoceros coronatus) has not been quantified. The overall population trend of these species is considered to be decreasing. Throughout its range it is reported to be rare to common. The generation length is 9.7 years. Their distribution size is about 1,720,000 sq.km. The Malabar pied hornbill (Anthracoceros coronatus) is approaching the thresholds for being Vulnerable under the range size criterion, under the population trend criterion and also under the population size criterion. 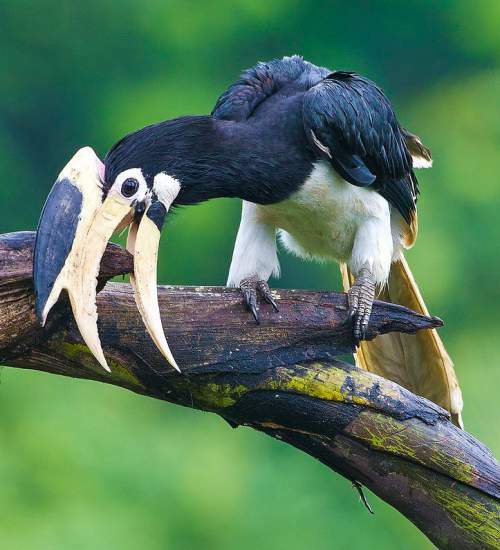 Loss of habitat, use of nestlings in native medicine and trapping adults and juveniles for pet trade are the main threats that may endanger the survival of these hornbill species. 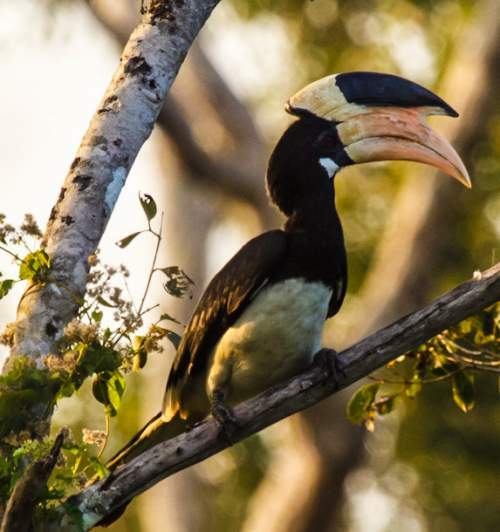 The IUCN (International Union for Conservation of Nature) has categorized and evaluated the hornbill species and has listed it as "Near Threatened". CITES (the Convention on International Trade in Endangered Species of Wild Fauna and Flora) status is ‘Evaluated’ for the Malabar pied hornbill (Anthracoceros coronatus) and is listed in Appendix II. Current topic in Birds of India: Malabar pied hornbill - Anthracoceros coronatus. Indian birds › Stork-billed kingfisher › Blue-tailed bee-eater - Merops philippinus. The blue-tailed bee-eater (Merops philippinus) is a richly coloured, slender bee-eater belonging to the family Meropidae. These bee-eater species are distributed in India, Pakistan, Bangladesh, Nepal, Myanmar, China, Sri Lanka and southeast Asian countries. These blue-tailed bee-eater species are gregarious and nest in colonies. These bee-eaters are monotypic species. The blue-tailed bee-eater (Merops philippinus) is closely related to Merops superciliosus (Madagascar bee-eater) and Merops persicus (blue-cheeked bee-eater). The blue-tailed bee-eater (Merops philippinus) is richly coloured and slender, measuring about 29 cm (excluding the streamers) in length and weighing 30 to 40 grams. The overall plumage of these bee-eater species is brownish green. The back and the head are brownish green. The distal end of the wings, rump and the tail are bluish. The breast and the belly are pale green and the undertail is pale azure. The central tail feathers are prolonged into bluish streamers. The blackish eye stripe extends beyond the eye and has bluish border. The chin and throat are brownish. The irises are brown and the beak is steel black. The feet are pale gray. Their call is a distinctive "pr-reee prreee" sound. 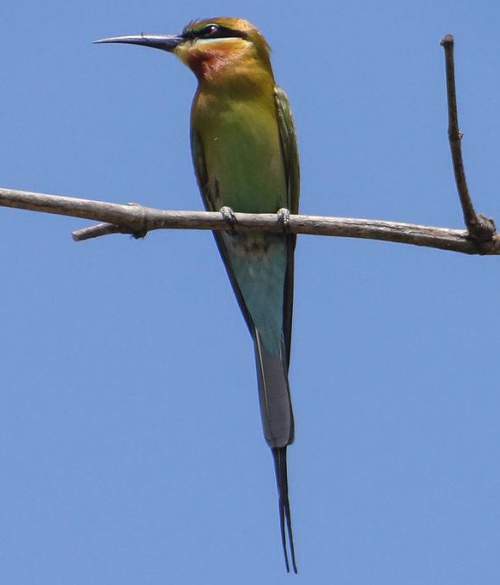 The blue-tailed bee-eater species are distributed in India, Pakistan, Bangladesh, Nepal, Myanmar, China, Sri Lanka, Thailand, Laos, Vietnam, Andaman and Nicobar Islands, Malaysia, Singapore, Indonesia, Philippines, Timor-Leste and Papua New Guinea. The blue-tailed bee-eater species have low forest dependency. These species occur in altitudes from 0 to 100 meters. They inhabit various natural forest and wetland ecosystems. They also inhabit artificial terrestrial ecosystems. Their artificial ecosystems include arable lands, plantations, pastures, rural gardens, urban parks and urban areas. The natural ecosystems of blue-tailed bee-eater include subtropical and tropical dry forests, subtropical and tropical moist lowlands, subtropical and tropical mangrove vegetation, freshwater lakes, rivers, streams and creeks. 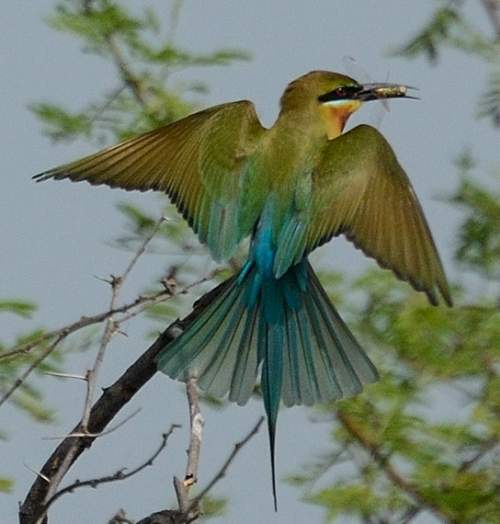 The diet of these blue-tailed bee-eater species is mostly flying insects. Dragonflies, honeybees, flies, wasps, hornets and beetles are the primary food. They catch the flying insects by sorties from an open perch. They beat the prey on the perch to break the exoskeleton and kill it. 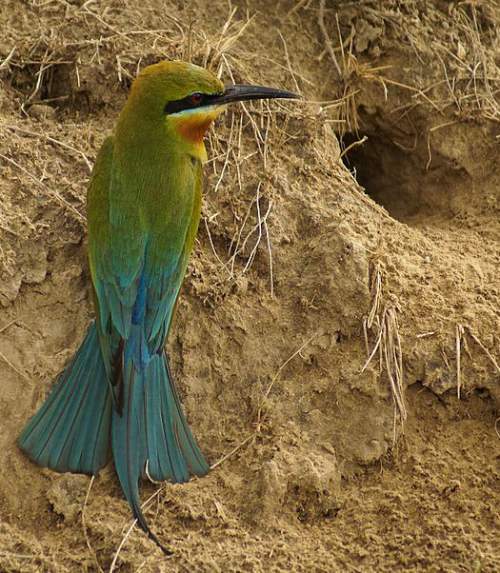 The breeding season of these blue-tailed bee-eater species is from February to June in north India. Like most of the bee-eaters, these species are also cavity nesters. They dig tunnels into the sandy earth banks on the sides of rivers and lakes. These bee-eater species nest in colonies. The incubating chamber is at the very end of the tunnel. The typical bee-eater clutch contains 5 to 7 spherical white eggs. Both the parents incubate the eggs and take care of the chicks. The blue-tailed bee-eater is a highly migrant bird. The blue-tailed bee-eater populations in central, north and northeast India, Pakistan, Nepal, Bhutan, Bangladesh, China, north Myanmar, north Thailand, north Laos and north Vietnam are migrants. They breed during the summer months. The northern breeding populations of these bee-eater species, winter in South India, Sri Lanka, Andaman and Nicobar Islands (India), Malay Peninsula, Indonesia (Sumatra, Java, Bali, south Borneo, west Timor and West Nusa Tenggara), East Philippines (Palawan) and Timor-Leste. The blue-tailed bee-eater populations in south Sri Lanka, south Thailand, Cambodia, south Laos, South Vietnam, Philippines, Indonesia (Sulawesi, East Nusa Tenggara) and north-east Papua New Guinea are residents and sedentary. Post breeding, the bee-eater juveniles may disperse and establish in new locations within the range. They may make local movements for feeding and breeding within their range. The global population size of the blue-tailed bee-eater (Merops philippinus) has not been quantified. The overall population trend of these species is considered to be stable. Throughout its range it is reported to be uncommon to locally common. The generation length is 6.2 years. Their distribution size is about 22,800,000 sq.km. The blue-tailed bee-eater (Merops philippinus) does not approach the thresholds for being Vulnerable either under the range size criterion, or the population trend criterion or under the population size criterion. Loss of habitat and feeding grounds are the main threats that may endanger the survival of these bee-eater species. The IUCN (International Union for Conservation of Nature) has categorized and evaluated the bee-eater species and has listed it as of "Least Concern". CITES (the Convention on International Trade in Endangered Species of Wild Fauna and Flora) status is ‘Not Evaluated’ for the blue-tailed bee-eater (Merops philippinus). Current topic in Birds of India: Blue-tailed bee-eater - Merops philippinus. Indian birds › Brown-backed needletail › Stork-billed kingfisher - Pelargopsis capensis. The stork-billed kingfisher (Pelargopsis capensis) is a tree kingfisher belonging to the family Alcedinidae. These kingfisher species are distributed in India, Bangladesh, Nepal, Myanmar, Thailand, Laos, Sri Lanka, Singapore, Philippines, Malaysia, Indonesia and Brunei. The stork-billed kingfisher has a large red stork-like bill. There are fifteen recognized subspecies of these kingfishers. The stork-billed kingfisher (Pelargopsis capensis) is closely related to black-billed kingfisher (Pelargopsis melanorhyncha). The fifteen recognized subspecies of stork-billed kingfisher are: P. c. capensis, P. c. gigantea, P. c. osmastoni, P. c. gouldi, P. c. intermedia, P. c. floresiana, P. c. burmanica, P. c. javana, P. c. malaccensis, P. c. innominata, P. c. cyanopteryx, P. c. isoptera, P. c. simalurensis, P. c. nesoeca and P. c. sodalis. The stork-billed kingfisher (Pelargopsis capensis) is a large kingfisher, measuring about 35 cm in length. The males weigh about 140 to 180 grams and the females weigh about 180 to 220 grams. Except for the size difference, both the sexes of these kingfishers species look alike. The head is pale olive brown and the back is greenish. The neck, breast and underparts are buff. The wings and tail are bluish. The bill is large and red with purple distal end. The legs are bright red. The irises are dark blackish brown. The bare skin around the eyes is pale red. The kingfisher call is a distinctive cackling "ke-ke-ke-ke" sound. The stork-billed kingfisher species are distributed in India, Nepal, Bangladesh, Myanmar, Thailand, Laos, Sri Lanka, Singapore, Philippines, Malaysia, Indonesia and Brunei. Vagrant birds have been observed in mainland China. The stork-billed kingfisher subspecies P. c. gigantea is distributed in central and southern Philippines. The subspecies P. c. floresiana is distributed in the Indonesian islands, Bali, Lombok, Sumbawa and Flores and Pantar. The subspecies P. c. gouldi is distributed in western Philippines. The stork-billed kingfisher subspecies P. c. javana is distributed in the Indonesian island, Java. The subspecies P. c. innominata is distributed in Borneo. The kingfisher subspecies P. c. isoptera is distributed in western Sumatra. The subspecies P. c. nesoeca is distributed in western Sumatra. The stork-billed kingfisher subspecies P. c. sodalis and P. c. simalurensis are distributed in northwest Sumatra. The subspecies P. c. cyanopteryx is distributed in the Indonesian islands Sumatra, Bangka and Belitung. The subspecies P. c. intermedia is distributed in Nicobar Island (India). The stork-billed kingfisher subspecies P. c. malaccensis is distributed in Kra (Thailand) and the Indonesian islands Riau and Lingga. The subspecies P. c. burmanica is distributed in Myanmar, Thailand and Indochina. The subspecies P. c. osmastoni is distributed in Andaman Island (India). The stork-billed kingfisher subspecies P. c. capensis is distributed in India, Nepal, Bangladesh and Sri Lanka. In India, these kingfisher subspecies are distributed in Kerala, Tamil Nadu, Karnataka. Goa, Maharashtra, Gujarat, Telangana, Andhra Pradesh, Madhya Pradesh, Chhattisgarh, Odisha, Uttar Pradesh, Jharkhand, West Bengal, Bihar, Assam, Nagaland, Meghalaya, Manipur, Tripura and Mizoram. The stork-billed kingfisher species are moderately forest dependent. These species occur in altitudes from 0 to 1200 meters. They inhabit natural aquatic, forest, marine and wetland ecosystems. They also inhabit artificial aquatic and terrestrial ecosystems. Their artificial ecosystems include arable lands, plantations, water storage lakes, canals, drain canals and large water holding pits and ditches. 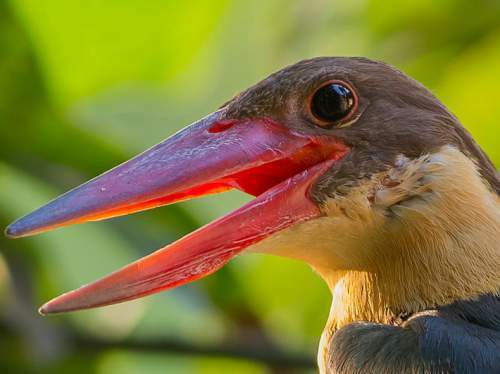 The natural ecosystems of stork-billed kingfisher include subtropical and tropical forests, moist lowlands, emergent mangrove vegetation, rocky shoreline, sandy or pebble shoreline, beaches, sandbars, natural freshwater lakes, rivers, streams and creeks. The diet of these stork-billed kingfisher species is mostly marine and freshwater fish. Frogs, fish, crabs and shrimp are the primary food. They also feed on lizards, rodents, young birds, large insects and several terrestrial and aquatic invertebrates. 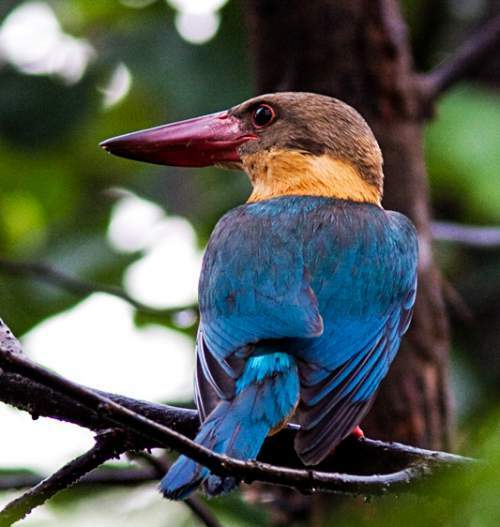 The breeding season of these stork-billed kingfisher species is from January to September in India. The breeding season is from January to May and also from August to September in Sri Lanka. The breeding season is found to be in April in Philippines and Nicobar Islands. Like most of the kingfishers, these species are also cavity nesters. They dig tunnels into the earth banks on the sides of rivers and lakes. They may tunnel into decaying trees, or tree termite nests. These stork-billed kingfisher species are monogamous and highly territorial. The incubating chamber is at the very end of the tunnel. The typical kingfisher clutch contains 2 to 5 white round eggs. Both the kingfisher parents incubate the eggs during the day. During the night, the female incubates the eggs. The stork-billed kingfisher is a non-migrant sedentary bird. Post breeding, the kingfisher juveniles may disperse and establish in new locations within the range. They may make local movements for feeding and breeding within their range. The global population size of the stork-billed kingfisher (Pelargopsis capensis) has not been quantified. The overall population size of these kingfisher species is considered to be declining. Throughout its range it is reported to be widespread and generally sparse but locally common. The generation length is 5.7 years. Their distribution size is about 16,800,000 sq.km. The stork-billed kingfisher (Pelargopsis capensis) does not approach the thresholds for being Vulnerable either under the range size criterion, or the population trend criterion or under the population size criterion. Deforestation and loss of habitat are the main threats that may endanger the survival of these kingfisher species. The IUCN (International Union for Conservation of Nature) has categorized and evaluated the kingfisher species and has listed it as of "Least Concern". 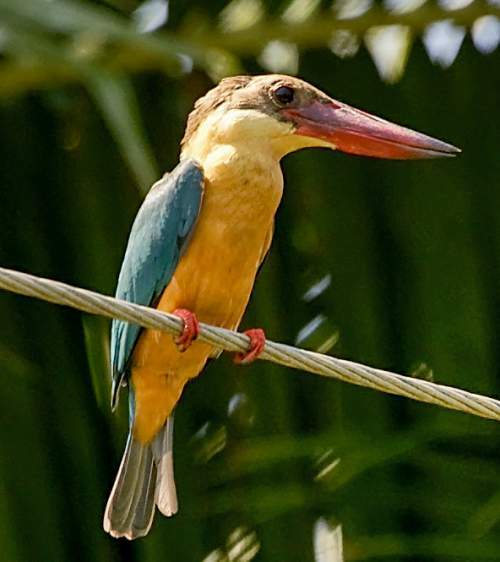 CITES (the Convention on International Trade in Endangered Species of Wild Fauna and Flora) status is ‘Not Evaluated’ for the stork-billed kingfisher (Pelargopsis capensis). Current topic in Birds of India: Stork-billed kingfisher - Pelargopsis capensis.